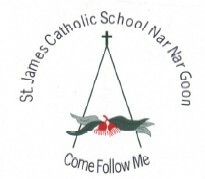 Welcome to St James Nar Nar Goon, a school community where students learn, laugh, play and explore the world around them. St James fosters a robust, learning environment full of safe, spacious and interesting spaces, where personalities can develop and friendships flourish. At St James, we support each student to build self-confidence, to feel part of their class and their school and to grow into happy, independent learners. St James celebrates individual, class and school community achievements. At St James we endeavour to use every opportunity to broaden our students' learning experiences.